Lamb curry or Gulai Kambing is a particular Indonesian food with unique taste. Not everybody like it. You have to like lamb first to like this authentic Indonesian cuisine. But this is one favorite of my son, who almost doesn’t like anything, strange but true. It’s taste really good if you make it on the right way. Just try, maybe you would like it. 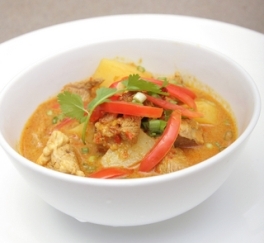 Try something different tonight; surprise your family with this Indonesian lamb curry recipe. Heat the oil in the pan and fry the smooth paste until fragrant, add the cardamom seeds, cinnamon, galangal, lemon grass, bay leaves, and kaffir lime leaves, set on low fire. Add the thin coconut milk. Continue cooking while stirring until the meat is tender. Add some salt and sugar. Let them cooked again, taste it and correct the seasoning if needed. Served with some krupuk and sambal.